Two changes from the starting XI that had suffered the stoppage time defeat at Shrewsbury two weeks previous. Yves Ma-Kalambay remained in goal with Ryan Allsop on the bench. “We deserved a point today, maybe more. The missed penalty will be looked back on, and hitting the crossbar, but people and moments are what keep you in the division. We’ve got the people, I know we have, but we just need to take our moments when they come, and we’ll survive. "[Wycombe] lost in the last minute and [Gareth Ainsworth] shook every one of our players’ hands. He’s an unbelievable man. We’ve not put the music on in the dressing room, purely and simply out of respect." The stoppage time defeat at Oxford saw Wanderers drop another place to 17th but with still a two point margin to the relegation places. After defeat at Oxford, Wycombe's winless run in the League stretched to 10 games. Failure to beat Portsmouth at home on Saturday 6th April 2019 will see Wanderers' winless run in the Football League extended to 11 games. That game is quickly followed by the home meeting with Charlton Athletic on Tuesday 9th April 2019. 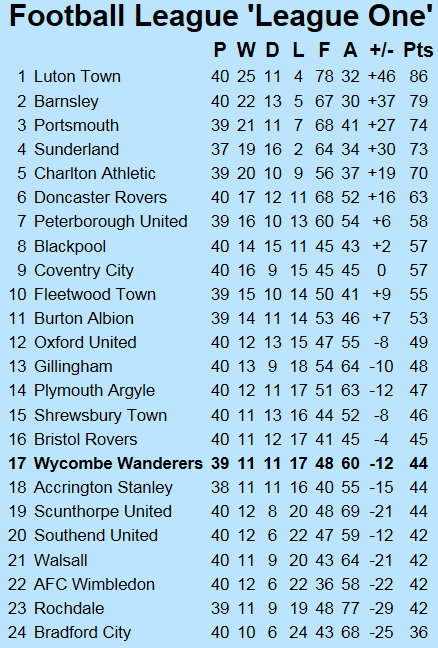 Only Southend United (Wanderers' opponents away from home on Saturday 13th April) are on a longer winless run. The defeat also marked the fourth consecutive game Wycombe had failed to win after taking the lead (Sunderland, Accrington, Shrewsbury and Oxford).